Complete number scoringWinner of game needs to be either the team color or team namePlayers names need to be filled in for the first game. It does NOT need to be filled in for the second and third games if there are no changes. Total points for each team,( 2 points for each win, + 1 point for highest score total )Capo’s signature (or team member) to verify the results are correct. 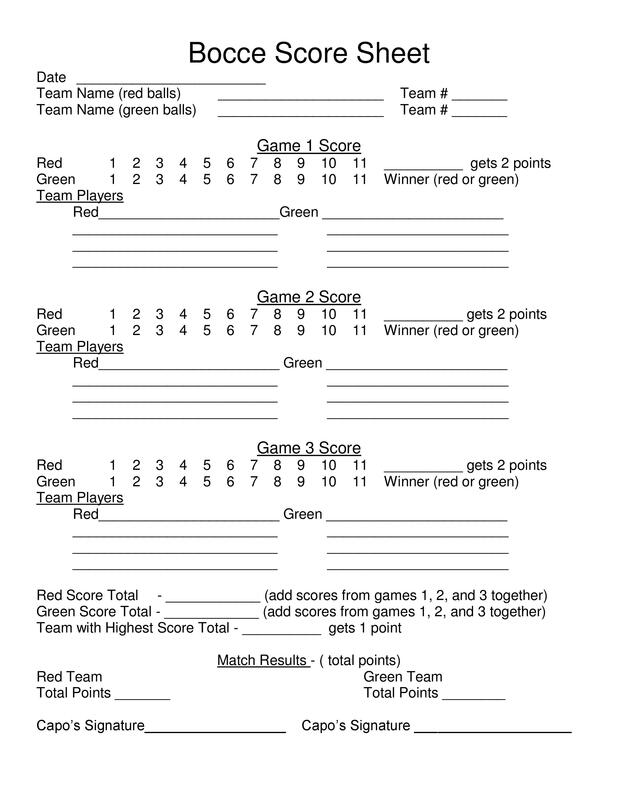 Download the FULL official copy of the 2016 Bridgewater Bocce rules here. Once the pallino is in position, the first team throws their bocce ball. Taking alternate turns, each team throws their balls toward the pallino to (A) get their ball closest to the pallino, (B) to move the pallino closer to their ball, or (C) move the opponent’s ball. The winning team begins the next frame. The game continues until 12 points have been scored or to pre-determined points set by the players before the game starts. Safety should be observed when playing bocce. It is recommended that players stay outside for the playing area when balls are being tossed.